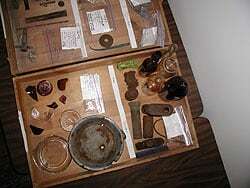 Archaeology: Why we know, what we know, about the past! Grades K - 4 Can You Dig It? Students discover the differences between rocks, fossils and artifacts through actual specimens and objects. This program is aligned with STEM and Local History. It's hands-on fun! Grades 5 - 6 Revolutionary Objects and Artifacts This program focuses on the story of America through the objects archaeologists find on typical historic digs. Students handle and observe different objects from the Revolutionary War through the Industrial Revolution to learn the differences between objects and what an artifacts can tell use about the people who used it. 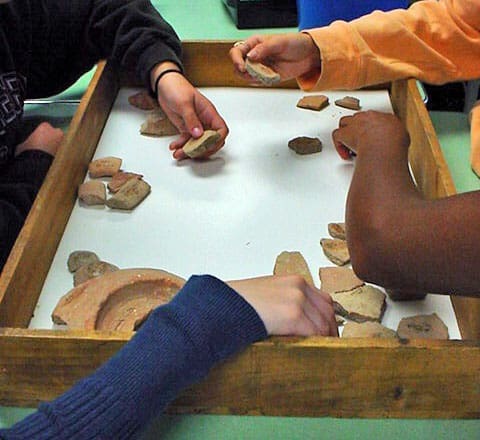 Grades 6 - 9 Hands-On Ancient History Students use actual ancient artifacts (1700 - 5000 years old), and take the role of archaeologists to understand the art, architecture and culture of ancient peoples. This program enhances Mesopotamian, Egyptian, Greek, Roman and Byzantine studies. There are optional pottery reconstruction or temple architecture activities specifically designed for this program. 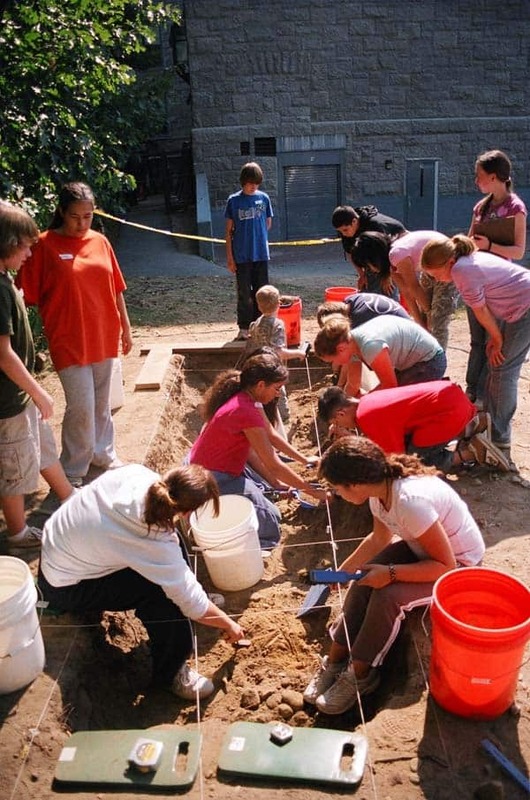 Grades 7 - 12 Forensic Archaeology This program is designed for Middle and High School classes to understand the science of forensics. 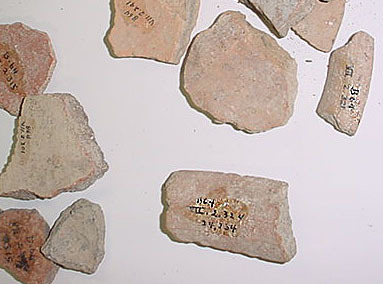 Students discover what residues are left behind after an ancient feast! 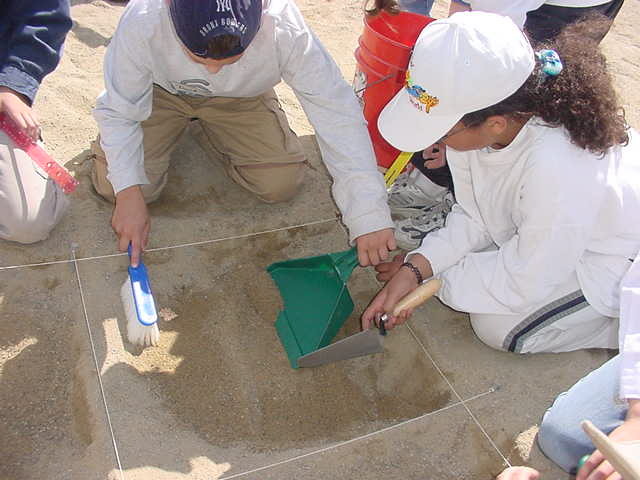 Grades 3 - 9 Mock Excavations Students become amateur archaeologists in this experiential learning experience. An excavation site appears on your school grounds and your students do the science, math and data recording that archaeologists do to discover the truth of the past. All artifacts and tools included! Grades K - 5 Auntie Indiana Jones Have "Auntie Indiana Jones" visit your school with her hands-on artifacts and stories of digs around the world. This assembly program can accommodate multiple grade levels during the same presentation.